Convert to Christianity; born in Germany 1648. His Jewish name was probably Weil, whence his surname von Weila. He embraced Christianity at Cleves in 1671, and became pastor in a Dutch village. 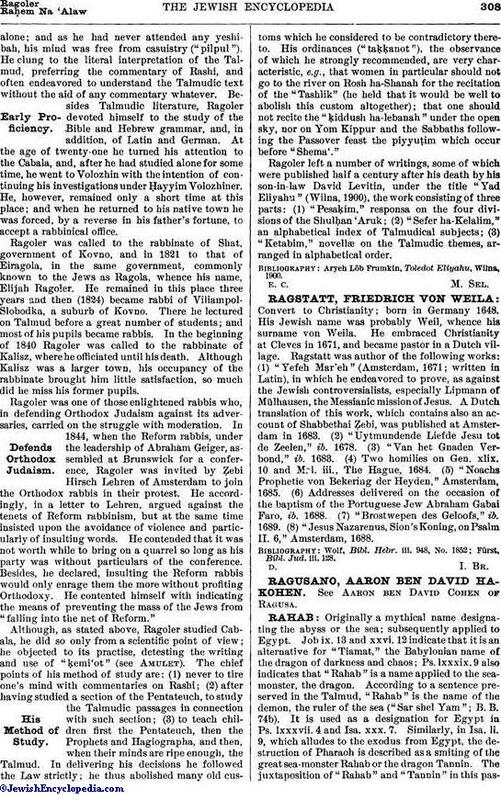 Ragstatt was author of the following works: (1) "Yefeh Mar'eh" (Amsterdam, 1671; written in Latin), in which he endeavored to prove, as against the Jewish controversialists, especially Lipmann of Mülhausen, the Messianic mission of Jesus. A Dutch translation of this work, which contains also an account of Shabbethai Ẓebi, was published at Amsterdam in 1683. (2) "Uytmundende Liefde Jesu tot de Zeelen," ib. 1678. (3) "Van het Gnaden Verbond," ib. 1683. (4) Two homilies on Gen. xlix. 10 and Mol. iii., The Hague, 1684. (5) "Noachs Prophetie von Bekering der Heyden," Amsterdam, 1685. (6) Addresses delivered on the occasion of the baptism of the Portuguese Jew Abraham Gabai Faro, ib. 1688. (7) "Brostwepen des Geloofs," ib. 1689. (8) "Jesus Nazarenus, Sion's Koning, on Psalm II. 6," Amsterdam, 1688. Fürst, Bibl. Jud. iii. 128.